A very common doubt among dog owners, when/how often do I cut my dog’s nails? There is no specific timeframe as is various from dog to dog and is affected by various factors. One important factor is the surface they spend time on. Whether it is the carpet, grass, concrete or mostly indoors. How often they walk what they eat and do they have health conditions are some other factors. Here’s a simple and easy to follow routine, you cut them only when they touch the ground. 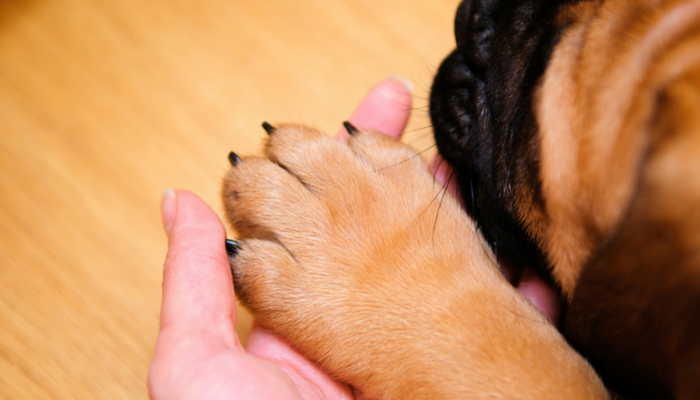 When your dog stands, clip or have their nails trimmed only to prevent their nails form touching the ground. Start slow to prevent bleeding and pain. If they spend a lot of time on concrete or rougher terrain and play around a lot, it is likely that they won’t need much trimming as friction will work its way and files them, keep the nails short. They can curl up, growing into their skin or paws which causes a lot of pain and even infections. However it is important to ensure you don’t cut their nails too short as this causes a lot of bleeding. However, if it does happen which is a likely possibility, use styptic powder or cornstarch to stop the bleeding.